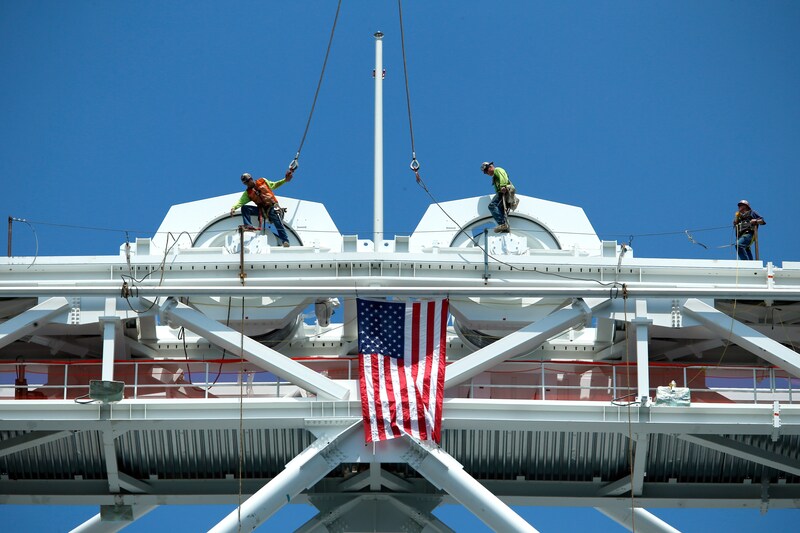 Construction workers install the final piece of steel for the roof structure of Arthur Ashe Stadium, June 2015. The goal of this strategy is straightforward: advance the country’s national interests and put the United States in the best possible strategic position regardless of how China acts. Ideally, China returns to a more peaceful and collaborative purpose, engaging in fair competition—instead of tilting the field—and using its growing military clout to pursue common objectives that other nations share. But as the United States continues to encourage China to change course, Washington must develop policies that respond to the realities of a more assertive China that is actively undermining U.S. interests around the world. Pillar Two: Leverage argues that where China’s strategic intent aligns with U.S. and broader global interests, the United States should seek to leverage rather than limit Chinese initiatives. It offers specific policy measures the United States must adopt to leverage China’s growing capabilities to solve global challenges. When the United States first reached out to China to establish formal diplomatic relations in the 1970s, China was poor, isolated, and unable to project military power beyond its periphery. Washington expected China to grow more powerful over time and assumed the best way to advance U.S. interests was to bring China into the international system and create incentives for China to rise within that system—and abide by its rules—rather than operate outside of it. Washington paired that open-door approach with a beefed-up security architecture designed to deter China from using its growing military power against U.S. allies and security interests in Asia. This “engage and hedge” strategy reached its apex in 2001, when the United States shepherded China’s entry into the WTO. Over the following decade, major political shifts in China and in the United States began to lay the groundwork for the China challenge the United States faces today. Shortly after China joined the WTO, Beijing began to reassess the nation’s economic path. China’s piecemeal market reforms benefited some interest groups more than others, and by the early 2000s, the losers were getting restless. China’s authoritarian regime does not provide effective channels for citizens to voice discontent; when frustrations are high, citizens join forces for collective protests that, from Beijing’s perspective, could easily spiral out of control. From the mid-1990s to the early 2000s, collective protest incidents rose from less than 10,000 per year to nearly 60,000 per year.1 Beijing feared the escalating unrest could coalesce into a massive social movement on par with the color revolutions that swept the former Soviet Union.2 At the same time, Chinese leaders also began to detect early signs that China’s development model—based primarily on low-value-added manufacturing and heavy-infrastructure investment—would soon run out of steam. The only way to keep growing was to shift into higher-value-added production. In the tech sector, for example, in order to manufacture and sell DVD players, Chinese companies had to rely on core technology from Hitachi, Toshiba, and other foreign patent holders, and they had to fork over one-third of the per-unit sales price in licensing fees.3 Beijing wanted Chinese companies to develop their own technology standards so they could shift from paying royalty fees to receiving them. But developing a knowledge economy based on the Western model—with broad access to information, a strong court system for intellectual property enforcement, and profit-driven financing—would require Beijing to relinquish more control over the nation’s economy and society. Instead of taking that risk, Beijing decided to follow a different path: Reassert state control over key sectors of the economy and use those controls to restructure global markets in ways that would benefit China at its trading partners’ expense. China’s economic pivot amounted to a rejection of the bargain Washington thought it struck with Beijing when it brought China into the WTO. The United States knew that welcoming a massive developing economy into the global trading system would inevitably pull manufacturing jobs from the United States to China. However, Washington expected that as China developed, the United States would gain new opportunities to export higher-value-added products to Chinese consumers, balancing the initial losses. From the beginning, Beijing’s goal was to catch up with and eventually surpass the United States. The United States helped China along by entering a multidecade period of inertia. On the foreign policy front, at the same time China joined the WTO, the United States launched two wars in the Middle East and South Asia that made it harder to invest in economic development at home or focus strategically on forward-looking diplomatic engagement in Asia. Unlike the Cold War, the war on terror did not force the United States to face off against a peer economic competitor, so Washington did not have a foreign policy imperative to upgrade the nation’s domestic economic capabilities. When global manufacturing began to shift to China following its WTO entry—pulling critical jobs out of the United States—Washington did not significantly ramp up domestic investments in education, public infrastructure, or R & D to help develop new, higher-tech industrial sectors and high-paying jobs to replace those lost to China. For both nations, the 2008-2009 global financial crisis was a major inflection point. On the U.S. side, one-fifth of American workers lost their jobs, and less than half have found new jobs with salaries equivalent to those they had before the crisis.19 In China, Beijing used a combination of capital controls and a $586 billion stimulus to avoid following the United States and Europe into recession.20 China weathered the crisis so well that many Chinese observers viewed it as an indicator that China’s state-directed economic model was superior to Western-style liberalism. The crisis also convinced many in Beijing that U.S. decline was officially underway, China was ascendant, and it was time for China to step forward and play a much bigger leadership role at the international level. After Xi Jinping took over as China’s top leader in 2013, he made expanding China’s global influence a top priority. The United States was slow to recognize the degree of change underway in China. Three factors muddied the waters. First, China was beginning to leverage its new capabilities to support global objectives the United States shared, such as joining forces with the Bush administration and other G-20 nations to prevent global economic collapse in 2008 and working with the Obama administration to secure the Paris climate agreement and the Iranian nuclear deal in 2015. Those successes produced positive examples of U.S.-China partnership that, at a macro level, counterbalanced some of the concerns growing in other areas. Second, for U.S. businesses, the picture was mixed. U.S. exports to China grew 86 percent between 2007 and 2017, and those exports support 1 million U.S. jobs.21 For every U.S. company sounding the alarm about Chinese malpractice—such as American Superconductor Corp., which spent years pursuing restitution after China’s Sinovel stole its wind turbine technology—there was another company describing China as a land of opportunity.22 Third, there was—and continues to be—a divide in China, with many experts and even senior party and government officials calling for more liberal economic reform. In November 2013, Xi Jinping released a sweeping 60-point economic reform blueprint that promised to let “market forces play a decisive role” in the economy.23 There were many hopeful reformers inside China reading that plan as an indicator that Xi’s escalating political crackdowns were primarily aimed at breaking up powerful interest groups blocking liberal economic reform. Those hopes were dashed in 2015 when China’s stock market crashed and the new leadership responded with heavy-handed interventions. These included banning major shareholders from selling their stocks and threatening to arrest those who did not comply; arresting journalists who shared negative information about the market; and using more than $200 billion in state funds to prop up the market through ad hoc purchases.24 Anti-market voices in Beijing utilized the crash to silence liberal reformers, arguing that market forces bring unacceptable political risks and the Chinese Communist Party (CCP)—not the markets—must play the decisive role going forward. On the political front, Beijing adopted a new foreign nongovernment organization (NGO) management law that requires U.S. think tanks, business associations, and other NGOs to apply for a permit from the Chinese police before visiting China for meetings and other “temporary activities.”31 These changes unfolded against the backdrop of a much broader domestic political tightening, in which the CCP enacted sweeping new controls over Chinese society, reducing the space for Chinese citizens to voice or hear independent views. When U.S. officials tried to push back against these measures, they discovered they did not have effective tools to do so. The U.S.-China Strategic and Economic Dialogue (S&ED) proved to be much more effective at highlighting areas of agreement than addressing disagreement. Annual S&ED meetings produced hundreds of Chinese commitments to address U.S. trade and investment complaints, but there was no formal mechanism to track implementation or to hold China accountable.32 Beijing made the same promises year after year, convincing many U.S. officials that China primarily saw the S&ED as a mechanism for keeping Americans running on a hamster-wheel of meetings, diverting energy they might otherwise use to pursue retaliatory actions that could impose real costs on China. U.S. companies could pursue anti-dumping or countervailing duty remedies through the U.S. Department of Commerce, but those remedies only apply to Chinese goods sold in the U.S. market. Companies could also petition the U.S. government to pursue cases against China at the WTO—something individual companies cannot do themselves—but that approach is slow, costly, and risks Chinese retaliation. Beijing frequently threatens to kick companies who file formal trade cases against China—or even just voice their complaints publicly—out of the Chinese market. To avoid that, many do not bother, choosing instead to accept their losses as a cost of doing business in China. Over time, those losses add up to a major erosion in U.S. competitiveness. Even when U.S. companies—or the U.S. government acting on their behalf—do win trade cases against China, Beijing frequently uses its state-controlled system to avoid enforcement. For example, in 2017, Beijing amended more than 1,000 cybersecurity standards, downgrading previously mandatory requirements to voluntary ones as a means to evade WTO scrutiny.33 However, despite the change in official language, Beijing still requires foreign firms to meet those standards in order to do business in China. The only difference is that those firms no longer have clear evidence to use for WTO complaints. When the world’s largest economy consistently evades accountability and enforcement, it begins to undermine the entire rules-based trading system. When the United States first engaged China, Washington assumed rules-based international systems were strong enough to shape China; instead, in the Xi Jinping era, it is discovering that China can undermine those systems in dangerous ways. The United States needs a new approach to China that takes into account Beijing’s new strategic intent and capabilities and directly addresses areas where Beijing’s current objectives—and the levers Beijing deploys to pursue them—either complement or conflict with U.S. interests. Beijing is currently pursuing these objectives in ways that create problems for the United States. To be sure, some of these objectives do create opportunities for the United States to work collaboratively with China to advance U.S. interests. For example, China played a key role bringing Iran to the table for negotiations to limit its nuclear program.35 In addition, the desire to step out and be recognized as a global leader drives Beijing to increase the nation’s contributions on global public-goods issues such as climate change, global health, and disaster relief, serving Chinese interests in ways that can benefit others as well. The problem is that, outside of the public goods space, Beijing increasingly takes a more zero-sum view, assuming the only way to achieve these goals is to carve out space for China from space currently occupied by the United States and its allies. From Beijing’s perspective, that effort pits China against a stronger power, and the best strategic approach is an asymmetric one—deploying unconventional, incremental tactics that aim to evade an opponent’s defenses over the long term rather than taking that opponent on directly or immediately. Beijing’s aim is to siphon off U.S. advantages and slowly shift the U.S.-China balance of power in small increments that do not immediately trigger U.S. defenses and enable Beijing to make large strategic gains without directly engaging a more dominant power in head-to-head competition. Across multiple issue areas, Beijing utilizes gray-zone tactics to gradually shift the U.S.-China balance of power through a series of seemingly small, incremental steps that, when added together, impose significant costs on U.S. prosperity and security. On the economic front, Beijing directs a mix of state-owned and private Chinese companies to acquire bits and pieces of U.S. technical know-how in a coordinated fashion to transfer entire U.S. value chains to China, piece by piece.36 Those transfers occur via a mix of commercial U.S. market acquisitions (such as Chinese entities entering the United States to purchase U.S. assets, as discussed in the limit section below) and regulatory requirements imposed on U.S. businesses seeking to enter the Chinese market (such as forcing U.S. businesses to transfer core technology to Chinese partners as a prerequisite for market access). China also engages extensively in industrial espionage—including cyberattacks—to acquire U.S. intellectual property, personnel data, and proprietary business information. At the same time, Beijing severely restricts the scope and scale of foreign investment in China in order to protect its own companies from competition, cultivating “national champions”37 that Beijing can then send overseas to compete against U.S. and other foreign firms in the global market. At a global level, China is working to undermine liberal democratic principles and augment or replace them with authoritarian ones.39 The current global governance system—the set of rules, institutions, and enforcement mechanisms the global community uses to solve common challenges—privileges liberal values such as freedom, democracy, binding international law, and inalienable individual rights. From Beijing’s perspective, that is a problem, because as China becomes increasingly integrated with the global system, integration exposes Chinese citizens to a set of ideals their current leaders do not intend to meet. To reduce that risk, Beijing is working to make the system more authoritarian. For example, Beijing is watering down human rights accountability mechanisms at the United Nations and rallying other nations to oppose a free and open global internet. Unlike the strategy the Trump administration is pursuing, this three-pillar approach prioritizes investments in U.S. strengths: the United States’ network of democratic allies, its democratic values, and the unlimited potential of the American people. It also leaves room for the United States to cooperate with China for mutual benefit on some issues while, at the same time, providing a clear framework to determine where the United States should pursue cooperation versus where it should push back. The United States has a set of core strategic advantages that it can and should draw on: The U.S. political system is resilient; the United States has strong allies and China does not; the United States’ friends and allies share many of the same concerns about China and, if the country and our leaders engage China correctly, they can stand together to form a united front on these issues. The next section of the report will describe what each pillar of this new strategic framework aims to achieve—limit, leverage, and compete—and lay out policy recommendations the United States can take to begin implementing them. U.S. markets and information platforms generally operate like an open public square. In the economic realm, individuals and companies from other nations can invest and do business in the United States; in the information realm, visitors from other nations can share their views with the American public, enjoying some of the same rights and freedoms—such as the freedom of speech—that Americans do. To be sure, everyone must follow the law, and screening requirements do apply in some cases—for example, foreign firms cannot purchase sensitive U.S. military technologies without prior screening and approval—but U.S. policy aims to keep the nation’s markets and information arenas open so that market forces determine business outcomes and the U.S. public can make its own decisions about which information to take in and how to judge that information. In contrast, although Chinese leaders recognize the benefits associated with open market and information systems, they view the risks as untenable in today’s China. Instead, they prioritize state control: They want the CCP to play a dominant role in determining business outcomes and shaping public opinion. Under Xi Jinping’s leadership, China is rolling back previous reforms that relaxed some of those controls within China. They are also doing something entirely new: leveraging China’s growing capabilities to extend elements of the CCP control playbook abroad. From Beijing’s perspective, open systems in the United States and other liberal democracies give China the opportunity to exert influence in those nations, acquire sensitive information and technology, and bolster China’s position at the target nation’s expense. Most Americans are familiar with Russia’s interference in the 2016 U.S. presidential election, but China’s operations—which include both influence activities and coordinated technology acquisitions—are just beginning to attract public scrutiny. Whereas Russia operates primarily in the digital space and seeks to sow divisions in U.S. society and undermine U.S. democracy, there is currently no evidence to indicate that Beijing seeks to follow that playbook. Rather, Beijing wants Chinese companies, organizations, and individuals to participate in U.S. markets, civil society, media, and policy debates the same way Americans do. That participation is not a problem. The problem is the coordination that sometimes lies behind it. On the economic front, Beijing dispatches an array of firms and investment funds to acquire U.S. technologies that China cannot yet produce on its own, bring that know-how back to China, and leverage it to undercut U.S. comparative advantages in global technology markets.40 These operations are well-coordinated, state-directed, and designed to boost China’s global economic position at the expense of the United States. The individuals, firms, and funds who carry out those operations often pretend to be independent actors pursuing their own private commercial interests. If that were the case, their acquisitions would be market-driven and generally would not pose a threat. In reality, some are agents of the Chinese state pursuing coordinated operations that distort and undermine U.S. market forces. For example, the Chinese government funds and co-directs 600 language programs embedded within U.S. educational institutions, including 500 Confucius Classrooms in U.S. primary and secondary schools and 97 Confucius Institutes in U.S. colleges and universities.49 Those programs provide Chinese language instructors and cultural programs that paint Beijing in a positive light, generally avoiding difficult issues such as the fact that Beijing is currently holding more than 1 million ethnic minorities in internment camps. As with the direct propaganda, the goal is to flood American students and policymakers with pro-China information in order to counterbalance more negative perspectives and push U.S. policy to be more accommodating. This distorts information about China within the United States and can undermine the American public’s ability to make fact-based assessments about China. The United States cannot force China to abandon these tactics and adopt liberal democratic principles or a market-based economy. What America can do, however, is counter these operations with enhanced transparency and screening. The challenge is to protect the United States’ values of openness and inclusiveness from entities that seek to participate in bad faith without compromising those values—a fine line to navigate. Unfortunately, U.S. history demonstrates how easily policymakers can overreact to legitimate national security concerns, producing remedies that undermine core democratic values. Current policymakers should follow three principles to avoid repeating past mistakes: 1) avoid remedies that infringe on legitimate free speech, freedom of the press, and academic freedom; 2) avoid actions and statements that frame the China challenge in racial terms, which can too easily trigger demonization and discrimination against Chinese Americans and the Chinese people; 3) in the economic sphere, avoid interventions that seek to decrease U.S.-China commercial engagement across the board and aim instead to target specific actors or operations that threaten U.S. prosperity or national security.51 These principles can help policymakers avoid remedies that themselves undermine democratic values and interests, such as banning all Chinese students seeking to study in American universities, imposing rules or demands on U.S. media entities, prohibiting certain types of university programming, or banning all Chinese companies that seek to do business in the United States. There is a solid middle path that addresses legitimate U.S. concerns about China in ways that strengthen our values instead of undermining them: When applying new screening measures, the United States should look for solutions that enhance transparency rather than close doors and sacrifice the benefits gained from open markets and free speech. Many of these coordinated Chinese tactics—such as Chinese government propaganda—lose their impact when they are exposed to public scrutiny. Hiding the coordination and government ties driving these actions is a key part of Beijing’s distortion playbook—once that is exposed, these operations are much easier to counter. Closing doors to shut off access to U.S. markets and information platforms should be done sparingly and only when transparency alone cannot get the job done. Although not a comprehensive list, the following sections outline some specific policy measures to operationalize this strategic concept. Congress recently enacted new, enhanced rules requiring Chinese and other foreign firms to undergo national security screening before investing in certain U.S. technology sectors. The problem with this approach is that technology value chains are constantly evolving. A static list of key industries will not keep pace with those changes. The United States should do more to target the real concern: covert Chinese government influence over U.S.-China commercial transactions. The United States should require all inbound foreign investors from all nonmarket economies to self-disclose their ownership structure, foreign government political affiliations (such as CCP cells within individual firms), and funding sources. Individual Chinese citizens already provide five years of employment history to obtain a visa to enter the United States; likewise, Chinese companies and investment funds should provide detailed information on their ownership structure and funding sources for the past five years in order to do business in the United States.52 This information will help U.S. regulators track Chinese government involvement across the U.S. economy and identify new areas of concern. Such areas include particular companies or funds carrying out coordinated acquisition activity—which U.S. regulators should investigate to determine if a state actor is directing that activity—and industries that are not on the list of sensitive sectors but are attracting a high level of potentially coordinated foreign investment interest. Strong disclosure requirements will deter at least some Chinese companies seeking to hide CCP and government ties—such as Huawei and ZTE, which refused to provide similar information in response to congressional requests—while keeping the door open for Chinese firms willing to abide by high-transparency standards. Congress must provide dedicated funding to enable relevant U.S. agencies—including functional agencies, such as the Departments of Treasury, Commerce, and State, as well as key intelligence bureaus—to monitor foreign investor activity across the United States, identify areas of concern, and investigate companies or groups of companies that fail to disclose foreign government ties or use their U.S. market presence to pursue covert political objectives. If U.S. regulators find Chinese companies or investment funds providing false information to hide their party or government ties, they can pass that information on to the CFIUS, which must have the authority to immediately block or unwind those transactions. It is not a problem for the Chinese government—or any other foreign government—to voice its opinions in the United States as long as American viewers understand where the material is coming from. The Federal Election Campaign Act’s requirement that campaign-related advertisements contain a disclaimer stating who paid for the ad can serve as a model for providing that transparency.53 The Department of Justice is increasingly enforcing the Foreign Agents Registration Act (FARA) requirement for state-run and state-funded press outlets to register as foreign agents—including China’s major state platforms—and that is a positive step. In addition, in order to provide broad public transparency, the United States should require all state-run and state-funded press outlets to label the public material they produce with clear disclaimers. For example, Chinese state press outlets should include disclaimers stating that the messaging is “paid for by the government of the People’s Republic of China.” Those disclaimers should apply to any foreign government and should be as prominent as the disclaimers required in U.S. campaign ads. Currently, the U.S. Higher Education Act only requires U.S. colleges and universities to report foreign government funding if the amount exceeds $250,000 per year.54 Congress should amend the act to require all U.S. colleges and universities to publicize foreign contracts or gifts (including in-kind gifts) that exceed $10,000 per year from a single foreign government, institution, or group of institutions from a single foreign nation. The Government Accountability Office (GAO) should publish annual assessment reports on foreign-funded programs in U.S. educational institutions to highlight areas of potential concern.55 To improve think tank transparency, U.S. think tanks and other civil society organizations should be required to publicly disclose foreign funding to maintain nonprofit status. The IRS already requires all tax-exempt organizations to file an annual publicly available information return—the IRS Form 990—and should amend that form to require tax-exempt organizations to disclose foreign grants and gifts. Congress can also support academic and think tank transparency by requiring experts to publicly declare foreign funding before participating in congressional hearings and other policy influence activities. The United States is struggling to effectively counter Chinese and Russian foreign interference operations in part because U.S. regulators are using a legal framework designed for a different era. Congress passed the Foreign Agents Registration Act (FARA) in 1938 to combat Nazi propaganda.56 Today’s challenges are different; they require a different toolkit. The existing framework contains multiple loopholes that today’s authoritarian regimes are vigorously exploiting. For example, FARA disclosure relies on voluntary compliance; it primarily covers lobbying and public relations work—not commercial activities; and there are broad exemptions, such as the exception for organizations involved in “religious, scholastic, or scientific pursuits,” which gives Confucius Institutes a free pass. Congress should overhaul this legal framework to address the mix of challenges the United States faces today, which includes Chinese Students and Scholars Associations working on Beijing’s behalf to curtail Chinese students’ academic freedom on American university campuses and American companies accepting financing from foreign government-directed funds (such as China’s IC fund) and utilizing it to help foreign governments acquire critical U.S. technology.57 The overhaul should aim to bring these activities into the light instead of blocking them, and it should enable coordinated oversight across issue areas, which the United States currently lacks. For example, if CFIUS identifies a Chinese commercial entity failing to disclose party or government ties, the committee should be able to hand that information over to a foreign influence process that requires U.S. firms who continue to accept funding from the Chinese entity to register as foreign agents before utilizing the funding for any future U.S. commercial deals. China’s Ministry of Finance recently used a series of front companies to circumvent both CFIUS and U.S. Department of Commerce export controls to successfully acquire Boeing satellite technology.58 China’s Ministry of Finance owns China Orient. U.S. regulators blocked a China Orient subsidiary—China Orient Asset Management Co.—from purchasing a U.S. satellite. China Orient Asset Management Co. then used two of its subsidiaries—one based in the Virgin Islands—to fund Global IP, a U.S. startup company, and utilize Global IP to purchase Boeing satellite technology, which China Orient then took over and likely passed on to the Chinese military. Requiring Chinese companies to declare their funding structures is not enough to expose deals of this nature. Legal reform is also needed to impose transparency on American companies who accept Chinese funding and, by doing so, allow Beijing to use them as covert technology acquisition agents. Chinese security officials are entering the United States under false pretenses to monitor and harass individuals—Chinese nationals and American citizens—who possess damaging information about the CCP or share views the regime seeks to suppress. The Trump administration has blocked U.S. law enforcement efforts to arrest the teams conducting those illegal activities. For example, in 2017, Chinese Ministry of State Security (MSS) officials used short-term transit visas to enter the United States and pressure a high-profile Chinese defector to stop publishing negative information about Chinese leaders and to return with them to China.59 The MSS officials repeatedly circled back to the defector’s home, blatantly violating U.S. law and ignoring U.S. demands to leave the country. The FBI requested permission to arrest the MSS officials, but the Trump administration blocked that effort.60 That case is reportedly one of many Chinese government intimidation and forced-rendition operations conducted against Chinese defectors, dissidents, and other political targets residing within the United States. The United States should adopt a strict zero tolerance policy regarding these operations. When law enforcement agencies discover Chinese security agents operating illegally within U.S. borders, they should prosecute those officials according to U.S. law instead of giving them a free pass. The United States should also publicize those cases, including by unsealing relevant indictments after arrests are made. Where China’s strategic intent aligns with U.S. and broader global interests, the United States should seek to leverage rather than limit Chinese initiatives. Those opportunities are most prevalent on global public goods issues. From a Chinese perspective, stepping up to play a larger role in multilateral efforts to address common global challenges fills two national objectives. First, if the international community welcomes and supports China as a global leader, that provides external validation for the CCP’s claim that it is restoring China’s greatness on the world stage. Second, as China deepens its involvement in global issues, Beijing takes an increasingly active role to shape global institutions, norms, and outcomes in ways that further China’s national interests. Those objectives give Beijing incentives to step forward in ways that the United States can and should leverage. From a U.S. perspective, where multiple nations must share the burden to address a common global problem—such as climate change, international development, environmental degradation, nonproliferation, disaster relief, or a pandemic disease—U.S. interests are best served when all nations contribute their fair share. China is the second-largest economy in the world and on track to surpass the United States in less than two decades as the world’s largest economy. If the United States allows China to free-ride on global public goods provision, the United States will inevitably carry some of China’s weight, and problems will be harder to solve. On disaster relief and refugee issues, for example, China can make economic contributions that reduce burdens on the United States and other nations—and that, without which, some of these problems would be impossible to effectively address. Beijing’s need for international validation gives the United States—and the broader global community—an opportunity to press China to carry its weight. When other nations welcome and applaud China’s leadership role on global challenges that buttresses the CCP at home. As the predominant global power, the United States has substantial leverage to shape the standards Beijing must meet to receive that validation. When the United States does not participate, China has more leverage to set those standards itself. The more the United States leans back diplomatically or cedes the field to China, the more discretion Beijing has to highlight positive impacts from Chinese actions; downplay or hide the negative impacts; and seek maximum international award at minimum cost. The problem is that the Trump administration does not have a coherent strategy for leveraging China. The administration’s National Security Strategy frames U.S. policy toward China through a zero-sum lens, suggesting that all of China’s current global initiatives directly undermine U.S. national security and that the primary U.S. objective on all fronts is to limit and provide alternatives to China rather than leverage China’s capabilities in ways that benefit everyone, including the United States. That approach forfeits opportunities to press China to carry its load on global public goods issues, increasing the extent to which critical problems will not be addressed adequately or to which others will have a greater burden to bear. Going forward, the United States needs to turn this dynamic around. The aim is to maximize China’s positive contributions not only by pushing China to contribute more on common global challenges but also by raising the standards China must meet to receive the international validation Beijing seeks. The following sections outline some near-term opportunities to do so. Working with Belt and Road Initiative target nations to set up regional platforms for project transparency and accountability. Beijing’s preferred approach is to set up Belt and Road Initiative projects in other nations via bilateral deals that are not fully disclosed to the public. That lack of transparency makes it difficult to accurately assess project impacts in addition to fostering corruption and crony capitalism. 63 The United States should work with existing institutions in Belt and Road Initiative target regions—such as the Association of Southeast Asian Nations (ASEAN) and the European Commission—to set up regional infrastructure investment transparency platforms that pool project oversight information in one centralized location. That information should include details such as lending terms; technology standards; how the project will benefit local public interests (such as environmental and employment impacts); and a proposed project’s greenhouse gas emissions impacts on recipient countries’ Paris climate agreement commitments. That information, once public, will empower Belt and Road Initiative target nations to push Beijing to improve project terms—including lower interest rates and higher project standards—and give the international community the information it needs to accurately assess and hold Beijing accountable for the initiative’s broader regional and global impacts. Working cross-nationally to improve competition and choice. For many Belt and Road Initiative target nations, the offers they receive from Beijing are the only offers on the table. This is particularly true when the recipient nation cannot pay the prices associated with higher project standards or more advanced technologies. In some cases, U.S. companies would like to put project proposals on the table to compete with China’s, but they cannot match the financing Chinese firms receive from China’s state banks. A more level playing field can drive higher quality projects, lower costs, and improve opportunities for U.S. companies to compete for at least some parts of these large projects. The United States should push international lending institutions to form capacity-building funds to help developing nations make the leap from low-standard to high-standard projects (for example, from high-emission coal plants to cleaner energy technologies). The United States should also get its own development financing in order. The U.S. Export-Import Bank, which provides financing for U.S. companies seeking to sell U.S. goods and services overseas, has not been fully operational since 2014. Last fall Congress authorized creation of the U.S. International Development Finance Corporation to support U.S. industry-led infrastructure development projects in emerging markets.64 That was a critical step in the right direction. Going forward, the Senate must confirm a full slate of nominees to the U.S. Export-Import Bank Board to enable Ex-Im to support U.S. companies seeking to compete for projects abroad. The United States can then leverage those two institutions as well as partnerships with development banks in other nations—such as Japan—to support U.S. companies with the interest and capabilities to put their own offers on the table. These measures would leverage competition to improve project impacts and give recipient nations more choice. Although the U.S. Pacific Command has led most of the strategic responses to major disasters in the Asia-Pacific region since the end of the Cold War, China has the capacity and resources to do more. The United States and China have conducted some joint exercises recently to execute complicated humanitarian assistance and disaster relief (HADR) operations in the region, but pushing China to share more of the burden would not only be good for the region but would also free up U.S. resources.65 As China is growing its military, Beijing must show that it intends to use it for regional peace rather than the apparent aggression—and working more on HADR is one way to do that. Xi Jinping and other Chinese leaders frequently state that China intends to fulfill its responsibilities to the global community on sustainability issues, and the United States has two near-term opportunities to leverage China’s commitments and capabilities in this space. First, the United States should re-engage in the Paris climate agreement—not only to advance and protect U.S. environmental, economic, and diplomatic interests but also to engage and, if/when necessary, challenge China on its performance in addressing climate change. Currently, the absence of U.S. leadership on climate is giving China wide leeway to set the standards by which the rest of the world is judging its actions. Although China is playing a largely positive role in this space, it is also hitting a difficult phase in its energy transition where coal use is trending upward, crude oil imports are soaring, and Belt and Road Initiative projects—many of which deploy outdated technologies—are contributing to greenhouse gas emissions in other nations. The United States needs to get its own house in order on the climate front, re-engage in the multilateral process, and lead an international effort to make sure China carries its weight. Second, the United States should partner with China on ocean protection. Overfishing, pollution, and unchecked resource extraction are currently undermining global ocean health and producing a range of economic and national security risks. China is the world’s largest seafood producer and has both the capabilities and interest to act to reverse current trends. The United States should work with China to improve standards in Chinese commercial aquaculture and to set up new marine protected areas, particularly in Asia, where fisheries are reaching crisis levels, and in Antarctica, where China joined Russia and Norway to block a proposal to protect a vast area of the Weddell Sea.66 The United States should also engage with China to rightsize capacity in its distant-water fishing fleet, both for national security purposes and to ensure global food security and fisheries sustainability. Global warming is bringing new pandemic disease risks. China’s large population serves as a critical disease incubator, and, as the world’s second largest economy, China has a large commercial presence in other nations and an outsized responsibility to work multilaterally to quickly respond to disease outbreaks. Despite that responsibility, China has a pattern of refusing to disclose outbreaks within its borders and refusing to share virus samples with the international community in a timely manner.67 The World Health Organization Pandemic Influenza Preparedness Framework requires member nations to promptly share disease samples with other nations following major outbreaks, but China refused to share samples from a deadly bird flu outbreak it experienced in 2016–2017.68 Without samples, the U.S. Centers for Disease Control is unable to develop vaccine and treatment protocols to prepare for a potential outbreak in the United States. The United States should establish new platforms for bilateral cooperation on pandemic disease and leverage the international community to push China for greater information transparency. China is competing against the United States on three primary fronts, each of which will pose substantial risks to U.S. national interests: economic and technical preeminence; the Asia-Pacific region; the global order. On the economic front, the United States seeks to maintain its economic primacy; China seeks to surpass the United States on its own terms. In the Asia-Pacific, the United States seeks to maintain regional stability, support international rules and norms—including democracy and human rights—and prevent the emergence of a regional hegemon. Meanwhile, China is pursing national objectives that challenge the status quo and undermine stability—particularly in the maritime space and around Taiwan—and seeks to establish a sphere of influence.69 At a global level, the United States wants to maintain a rules-based global governance system that not only promotes peace but also protects democracy and strives toward upholding universal rights; Beijing wants a system based on authoritarian governance principles in which nations negotiate issues bilaterally and are not held to common rules or standards. It is natural for China to seek a stronger global position and stronger influence over global rules and norms as its capabilities grow, and the United States should not shy away from nor be intimidated by rising Chinese competition. The United States holds multiple advantages over China. The problem is that the United States is not effectively leveraging those advantages for two reasons. First, the United States is failing to make the necessary strategic investments, both in its domestic economy and foreign and security policy. At home, the United States is not adjusting its economic policies to account for globalization. The international economy has shifted, but U.S. workers have not received the support they need to adjust to the consequences of an increasingly globalized economy. Wages are not rising despite strong economic growth, and the American middle class is being hollowed out. The United States has failed to establish domestic policies that ensure the benefits of growth are broadly shared; the result is increased inequality, stagnant wages for workers, and the lack of a viable economic model for shared prosperity in the 21st century. Going forward, the United States must make the necessary investments in the innovation drivers—science and technology education, R & D, among others—that are needed to sustain its comparative advantages in the global economy and pair those investments with policies that ensure gains are distributed equitably. A similar pattern is playing out on foreign and security policy, where the United States remains deeply invested—both in terms of resources and strategic focus—in the challenges of the past two decades. To counter this approach, the United States must target the broader pattern instead of the tactical moves and immediately shift to comprehensive competition both in the bilateral relationship and on the international stage. This is what Beijing is working diligently to avoid, and it is a key to U.S. success. To be clear, the goal is not to prevent or hinder China’s rise; rather, the goal is to prevent China from fueling its rise and reshaping the international order in ways that are against fundamental U.S. interests. To be successful against this new and powerful competitor, the U.S. must first take steps to improve its own competitiveness. Even if China’s illegal and predatory tactics are reduced or eliminated, China will still be a formidable economic and military competitor. The United States must invest in its own competitiveness and double down on its own comparative advantages—the advantages that China cannot match—and prepare itself to compete with China comprehensively over the long term and at full strength. The following sections outline some specific steps for the United States to take. Rebuild workforce development infrastructure. The publicly funded job-training system is failing to keep pace with fast-paced technological change. Meaningful federal-level investments are required to turn that around.74 While upskilling matters in bridging the opportunity gap, skills attainment alone is only a rough proxy of employment prospects when structural bias acts as another barrier to finding a good job. Future job prospects vary depending on several factors, including: whether a job-seeker has been unemployed for a long time; is a veteran or a woman in nontraditional training; has finished high school; has a disability; or has a first language other than English. With profound changes in the nature of work underway, the United States must adopt a more inclusive economic systems strategy that empowers workers to find future-proof jobs and strives toward equitable labor force participation and full employment. That will require the United States to redesign its workforce development system to better adjust to economic cycles and match its labor needs. Among other things, the United States must facilitate effective and equitable matching processes to quality jobs and embed and reinforce targeted interventions that maintain lifelong connections to work. Invest in productive public infrastructure. The federal government has significantly withdrawn from its role supporting the creation and maintenance of productive physical infrastructure. Net federal investment in nondefense has fallen sharply since the mid-1980s and is at its lowest level, relative to GDP, since 1948. The United States needs to increase public investment in the infrastructure that forms the foundation of the American economy—transportation, clean energy, water, community facilities, affordable housing, and high-speed internet—in a manner that leverages both federal funds and public-private partnerships to improve economic vitality throughout the country. That should include a special focus on areas where past discriminatory infrastructure investment policies exacerbated social inequities.76 To prepare all American communities for the challenges of the 21st century, public infrastructure design and siting must take into particular account the growing importance of the digital economy, wealth inequality, and climate change. Rally other nations to jointly file a nullification and impairment case against China at the WTO. The WTO dispute settlement provisions give member nations the option to file cases against nations whose actions violate the organization at a foundational level and, by doing so, effectively nullify the benefits the organization was designed to provide its members. 77 It is time to pull that lever on China.78 At a minimum, filing a nullification and impairment case against China will shine a light on what China is doing; how that destabilizes the system; and the need for dramatic system-level change. If the WTO rules against China, that will force China to either substantially change its policies or exit the organization. If the case fails, it will highlight the ways that the current system is unable to meet the challenge China poses and help build multilateral support for system-level reform, which could include a post-WTO multilateral trading system. Negotiate a digital trade agreement with the European Union, Japan, and the Five Eyes intelligence-sharing partner nations (the United States, Australia, the United Kingdom, Canada, and New Zealand). As the recent CAP report “Mapping China’s Global Governance Ambitions” demonstrates, China’s digital infrastructure expansion poses multiple near-term risks, particularly on 5G mobile communications infrastructure.79 The global internet is on track to become dependent on Chinese equipment and standards, and Beijing is leveraging that dependence to push authoritarian governance principles, including state control over internet activity. U.S. economic competitiveness depends on an open global internet. In 2016 the U.S. digital economy supported 5.9 million jobs at wages nearly twice the national average.80 The United States exports over $400 billion per year in digital services; in contrast, soybean exports total around $30 billion per year.81 Global commerce increasingly runs on digital infrastructure, and the United States cannot afford to sit back and allow China to control that infrastructure. The United States should work with like-minded partners to create a safe space for digital trade, one that enshrines open internet principles. That agreement should combine the digital two-dozen regulatory principles with European privacy rules, which the United States should adopt. Information and communication networks are the infrastructure of the 21st century. U.S. prosperity and national security depends on a secure and open global network that can provide a level playing field for U.S. firms engaged in e-commerce; support freedom of expression and global information exchange; and protect users from cyberthreats. China is currently threatening all of those objectives. Chinese firms are building and operating digital networks around the world that, according to current Chinese law, Beijing can use for intelligence-gathering and other objectives that further China’s national interests. Beijing is also leveraging China’s digital infrastructure presence in other nations to build global support for Chinese-style internet regulatory principles that give states the authority to control internet activity within their borders. Coordinated action is needed to keep the global Internet open and secure as it migrates toward next-generation technology standards—not only 5G, but beyond. As the world transitions to high-speed digital infrastructure, digital backbone networks increasingly serve as broadcast networks. Thus far, China’s Huawei has 30 commercial contracts to supply 5G equipment to other nations.82 If Huawei follows the same model in 5G that it employed in 3G and 4G, some of those contracts will give Chinese firms control over network operations, including broadcast operations. That is already a problem in Africa where StarTimes—the Chinese media conglomerate and digital TV provider—often follows behind Chinese equipment providers.83 African nations, in particular, are asking for international assistance to help ensure that rapid digitalization—which increasingly entails a move to Chinese technology, financing, and network operations—does not erode freedom of expression. The United States should lead a global effort among democratic nations to adopt common governance principles for managing broadcast traffic in the digital era. That effort should also address best practices for providing interoperability between free and open internet systems and those that utilize Chinese technology and governance principles. Following the Edward Snowden revelations, many nations may have concerns about Washington’s motives. To help address those concerns, the United States should enlist independent actors with broad credibility to pressure the Internet Corporation for Assigned Names and Numbers (ICANN), the Internet Engineering Task Force (IETF), and other self-regulatory bodies to challenge Chinese efforts to erode the free and open global internet. The United States should lead a global effort to ensure digitalization does not erode freedom of information. The United States should make digital infrastructure financing a high-priority focus for overseas aid.84 For many developing nations, China is the only low-cost option for digital infrastructure. Yet, the United States provides over one-third of global development aid. The United States should utilize that funding to provide a digital alternative for developing nations, giving them access to secure technologies and assistance to develop high-standard governance principles for a free and open internet. Those options must be as affordable as the Chinese alternative. Developing nations should not be forced to choose between network performance and affordability or internet freedom. The United States should convene a global effort among democratic nations to develop and adopt a set of common principles and standards for artificial intelligence (AI) to ensure AI development does not threaten democratic governance or human rights. That effort should incorporate civil society efforts and build on the work the European Union is doing to develop guidelines for trustworthy AI. The United States and the European Union should encourage all states to adopt these principles and standards and to monitor compliance by private and public sector actors. China is already a global leader in AI technology. China is also developing and utilizing AI technology to monitor and control its citizens domestically, and it is exporting those technologies to help other authoritarian regimes follow suit.85 If China leverages its current position as an AI leader to set global technical and/or governance standards for facial recognition systems, machine learning, and other AI tools, that could erode freedom across the globe. If democracies work collaboratively to develop common AI standards and principles to protect citizen freedom, that will provide a critical counterweight. Creating an informal Asia-Pacific Democracy Network. The United States should try to create a quiet, informal group of countries beyond the high-profile Quadrilateral Security Dialogue with the goal of strengthening security cooperation in Asia by fostering and operationalizing day-to-day cooperation on security issues, including maritime security, defense planning, and joint exercises. Boost funding for building maritime capabilities in Southeast Asia. These investments should include increasing funding for the U.S. International Military and Educational Training (IMET) program with a priority for Southeast Asian militaries and expanding the Southeast Asia Maritime Security Initiative launched during the Obama administration. Transform the East Asia Summit (EAS). The United States should work with ASEAN and regional allies to transform the EAS into a more robust forum for forging and enforcing security rules and norms in Asia. The eventual goal would be a forum where all countries could constructively discuss thorny regional security issues and convene in times of crisis to defuse tensions. The U.S. edge against China in the western Pacific is decreasing as a result of China’s investments in anti-access and area denial capabilities. If the United States is to effectively deter China in contested domains, the United States will need to continue to retool and strengthen its force posture in Asia, in conjunction with those of allies, as China’s military capabilities grow. Specifically, the U.S. should redesign its power projection capabilities to counter China’s anti-access and area denial investments, first, by fundamentally rethinking how the U.S. projects power into the region. The U.S. should reinvest in its abilities to ensure resiliency against attack, increase reliance on more survivable surface and subsurface vessels, and reduce dependency on a small number of vulnerable high-value fixed assets located within range of China’s rocket forces. The U.S. should also invest in information warfare, global intelligence, surveillance, and reconnaissance (ISR), integrated command and control, long-range strike, and prepositioned equipment, such as munitions that can be used interoperably with allies. Some forward deployed U.S. forces are necessary to reassure allies and show U.S. resolve. However, those forces should be tailored to military capabilities the U.S. can uniquely provide and consistent with realigned roles for the United States and its allies. Lead a liberal democratic effort to protect and revitalize the global governance system. Xi Jinping is working to undermine the current rules-based global order and transform it into one that is safe for autocracy. The United States must counter that effort. To succeed, the United States must join forces with other liberal democratic nations to figure out what democracies want the global order to look like over the coming decades and how to create more space within the international governance system for China and other developing nations without ceding ground on fundamental principles. With that common vision in hand, the United States must also lead a multilateral effort to push back against Chinese attempts to undermine the current system, such as China’s efforts to undermine binding international law and human rights accountability at the United Nations. One possibility is for the United States to invest in transforming the existing Community of Democracies into a robust community that can coordinate action amongst democracies to solve major international challenges and fight back against China’s attempts to undermine international institutions and norms. Push Beijing to clarify its intent regarding global governance reform. Xi Jinping has stated that China intends to “lead the reform of the global governance system” and that China’s end goal is to make the system more balanced, democratic, and diverse, creating a “community of common destiny for all mankind.”87 However, foreign policy discussions within China and China’s pattern of actions thus far indicate that Beijing’s real aim is to make the system more authoritarian. When Xi Jinping and other Chinese leaders make lofty promises to the international community, the United States should challenge them to define the terms they are using and explain how specific scenarios—such as a difference in interests between nations—would play out under China’s alternative vision for the global order. Hold China accountable for its domestic human rights abuses, particularly those targeting Uyghurs and other marginalized groups. Domestically, China has arbitrarily detained an estimated 1.5 million Uyghur—along with members of other traditionally Muslim and Turkic ethnic groups—in massive extrajudicial internment camps.88 Detainees released from the camps report beatings, forced consumption of unknown drugs, deaths in custody, forced labor, and other conditions that violate the United Nations Standard Minimum Rules for the Treatment of Prisoners and China’s commitments under the United Nations Convention against Torture.89 Internationally, China is using its seat on the U.N. Human Rights Council to put forward and pass U.N. resolutions that give states maneuvering room to abuse human rights in order to pursue other objectives such as economic development or social stability. In addition to calling out China and pursuing bilateral approaches to pressure China over human rights, the United States must immediately return to and re-engage in the U.N. Human Rights Council and rally other democracies to strengthen human rights accountability mechanisms. Launch a comprehensive, whole-of-government Taiwan Relations Act implementation assessment. In 2014, a youth-led social movement erupted in Taiwan to protest then-president Ma Ying-Jeou’s attempts to sign a trade agreement with mainland China that many feared would undermine Taiwan’s political independence. In 2016, Taiwan’s citizens elected Tsai Ing-wen—who represented the independence-leaning Democratic Progressive Party—as president. Beijing responded with a pressure campaign that aims to isolate Taiwan diplomatically and—through interference in Taiwan’s democratic system—undercut domestic political support for Tsai Ing-wen. The Taiwan Relations Act states that U.S. policy toward the People’s Republic of China and Taiwan “rests upon the expectation that the future of Taiwan will be determined by peaceful means.”90 It is necessary to assess—in a comprehensive and empirical manner—whether mainland China’s pressure campaign is violating that principle. The interference tactics Beijing is deploying in Taiwan mirror those Russia is deploying in the United States, using digital platforms and information warfare tactics that were not foreseen when Congress passed the Taiwan Relations Act in 1979. The United States should also assess how it has implemented the Taiwan Relations Act since 1979 and whether updates are needed to provide clear guidelines on issues such as defense requirements and exchanges between U.S. and Taiwan senior-level officials. The U.S. government cannot fully understand and address the scale of the China challenge without focused investments on its own human capital as well as its national policymaking process. It is essential that the United States improve its capacity to understand China and formulate well-informed policies. Launch a U.S. government human capital strategy on China. Since September 11, the U.S. government has made major investments in counterterrorism and in Middle East and South Asia expertise to address the security challenges that have dominated U.S. national security policy. It is now imperative that U.S. departments and agencies make strategic investments in developing deep expertise on China, especially foreign language proficiency, in order to generate better policy and strategy. Understanding and adequately addressing the China challenge will require personnel who can read and speak Chinese; who understand the complex Chinese political system and how it operates; and who have studied the deep history of the Chinese people. It is also essential to increase the number of diplomatic, defense policy, economic, and commercial personnel dedicated to the China challenge. Improve U.S. policy integration on China. To ensure that the U.S. government can strategically address the China challenge across the national enterprise, the U.S. should establish more integrated policymaking and decision-making on China. Joint meetings of the National Security Council, National Economic Council, and Domestic Policy Council should be institutionalized to ensure that national policy planning on China is more strategic. The next president should consider issuing a policy directive to lay out a strategic framework and national goals with respect to China that will organize and drive U.S. government efforts. Invest in the Chinese language pipeline. Developing human capital with the relevant skills to meet growing demand for China expertise from the U.S. government, civil society, and the private sector will require a redoubled investment in Chinese language instruction in the U.S. school system. Federal and state governments should include Chinese language programs as a priority for funding and should support utilization of online learning programs both to improve access to Mandarin instruction in remote or underserved communities and to offer instruction in less commonly taught languages such as Cantonese, Uyghur, and other regional dialects. The most difficult decisions for the United States in maintaining stability in Asia will come when faced with confronting Chinese assertiveness in maritime hotspots such as the South China Sea and the East China Sea. In both cases, China uses gray-zone—or salami-slicing—tactics to methodically pressure other countries with competing sovereignty claims without being so aggressive as to trigger a response from the United States or the international community. Individual disputes are unique, and U.S. policy approaches to each must likewise be unique. However, there are important principles that should inform U.S. policy across the board. Encroaching Chinese capabilities and assertiveness will, over time, make it more difficult for the United States to effectively deter or respond to Chinese actions in maritime hotspots. Defend treaty allies. The United States must uphold its defense treaty commitments to the two countries—Japan and the Philippines—involved in territorial and maritime disputes with China in order to maintain stability in Asia and to uphold broader norms of nonaggression. The United States must send early, direct, and consistent signals to China and to its allies and partners in the region that the United States will come to the defense of its allies and partners in the event of Chinese aggression. To do so, the United States must be willing to choose opportunities to demonstrate its relevant military capabilities in order to reinforce deterrence. Uphold international law and norms. Many of China’s tactics in these hotspots intentionally avoid outright aggression but rather seek to coerce by using force to dissuade other countries from sailing in international waters, for instance. This requires the United States to stand firm when international principles such as freedom of navigation are violated and continue to fly, sail, and operate wherever international law allows, despite China’s protestations. To strengthen its own position, the United States should ratify the U.N. Convention on the Law of the Sea (UNCLOS) as soon as possible. The United States should also work multilaterally with other like-minded nations to reinforce these rules and norms, for example, with joint or coordinated navigation and overflight operations. The United States should also support other countries’ use of international legal mechanisms to challenge China’s excessive maritime claims and actions, such as when the Philippines did by bringing a case to the International Tribunal on Law of the Sea. Uphold regional stability. While deterring China and responding to its coercive activities, the United States must also emphasize regional stability as essential for its allies, partners, and for the interests of the American people. This means prioritizing intensive bilateral and multilateral diplomacy with China to find ways to reduce tensions, such as fostering discussions amongst claimant states in the South China Sea and using the East Asia Summit to find frameworks for operating in the air and maritime space. Cultivating open communication channels at key bureaucratic levels. Beyond formal meetings, there also need to be better infrastructure to support informal communications between both countries’ officials. In addition to regular high-level dialogues between security, military, and economic officials, U.S. and Chinese leaders must have a consistent and regular dialogue. The two countries should also ensure that the high-level dialogue on sensitive and difficult security challenges—bringing together senior leaders from the defense, military, and intelligence agencies—actively continues regardless of tensions. Strengthening mechanisms to reduce the chances of miscalculation and conflict. The United States and China should build mechanisms and protocols that ensure that unsafe military encounters and accidents do not escalate in the South China Sea and beyond.91 In addition to conventional military operations, the two countries should also discuss cyberinterventions and work toward a shared understanding of the rules of the virtual road. Although the two countries may not fully agree on those rules, some clarification of red lines can help manage expectations, reduce miscalculations, and limit unintended escalation. Message the threat accurately and hedge against misunderstanding. There is a risk that overstatement of the disagreements between the two countries will further close the remaining space for cooperation as each side begins to interpret the relationship as increasingly zero sum. Therefore, both sides must carefully articulate where shared interests remain, which requires officials in positions of responsibility to be judicious in how they describe the threats posed by the CCP and the policies they recommend to address them. The U.S. government should make clear that it is concerned about the actions of the Chinese government and avoid painting the actions of the CCP as representative of all Chinese people. Two decades into the 21st century, China’s ambitions—economic, political, and territorial—have created a global storm. If the United States maintains its current course, it will cede substantial ground to China. To turn this dynamic around, the United States must reinvest in its own unique strengths and principles. At home, it must address its economic challenges head-on and invest in the fundamental drivers of economic prosperity and national security. Globally, it must reach out multilaterally to lead and build a united front with allies and partners. With those core fundamentals in place, the United States can then execute a strategy that limits China’s ability to exploit its openness; leverages China to contribute its growing capabilities in ways that benefit the global common good; and positions the United States to compete more comprehensively over the long term. The authors thank Center for American Progress China and Asia Policy Analyst Blaine Johnson for providing research support throughout the drafting process. The authors thank American Progress colleagues Abby Bard, Colleen Campbell, Simon Clark, Kevin DeGood, Rudy deLeon, Khyle Eastin (Intern), Matthew Feng (Intern), Mike Fuchs, Miriam Goldstein, Andy Green, Marc Jarsulic, Frank Kendall, Carolyn Kenney, Livia Lam, James Lamond, Jacob Leibenluft, Kate Martin, Ben Miller, Katrina Mulligan, Lisette Partelow, John Podesta, Daniel Rice (Intern), Vikram Singh, Trevor Sutton, Neera Tanden, Alex Tausanovitch, Lauren Vicary, and Alan Yu for their contributions to this report. The authors also thank the foreign policy experts who served as external reviewers and provided wisdom that strengthened the final draft. Melanie Hart is a senior fellow and director for China Policy at the Center for American Progress. Dr. Hart’s research focuses primarily on China’s domestic political trends, U.S.-China trade and investment, Chinese foreign policy engagement in Asia, and U.S. foreign policy toward China. She founded and leads multiple U.S.-China Track II dialogue programs at CAP and frequently advises senior U.S. political leaders on China policy issues. She has a Ph.D. in political science from the University of California, San Diego and a B.A. from Texas A&M University. Kelly Magsamen is the vice president for National Security and International Policy at the Center for American Progress. Previously, she was the principal deputy assistant secretary of defense for Asian and Pacific Security Affairs and also performed the duties of assistant secretary of defense, where she was responsible for defense and security policy for all of Asia and served as principal adviser to the secretary of defense. In these roles, Magsamen shaped Department of Defense policy and strategy in the South China Sea and was responsible for strengthening and modernizing U.S. alliances and partnerships in the region. Prior to her tenure at the Pentagon, Magsamen served on the National Security Council staff for two presidents and four national security advisers.